Experts estimate that approximately 10 million Americans have at least one tattoo. Of those 10 million people, at least half later regret it and want them removed! Tattoo removal is often prompted by a change in lifestyle, personal taste or career. 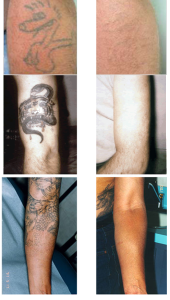 For the past three decades, tattoo removal was done using unsophisticated surgery techniques, all of which could leave individuals with scarring. However, with the recent advances in medical technology, laser therapy has become the gold standard for removal of tattoos. 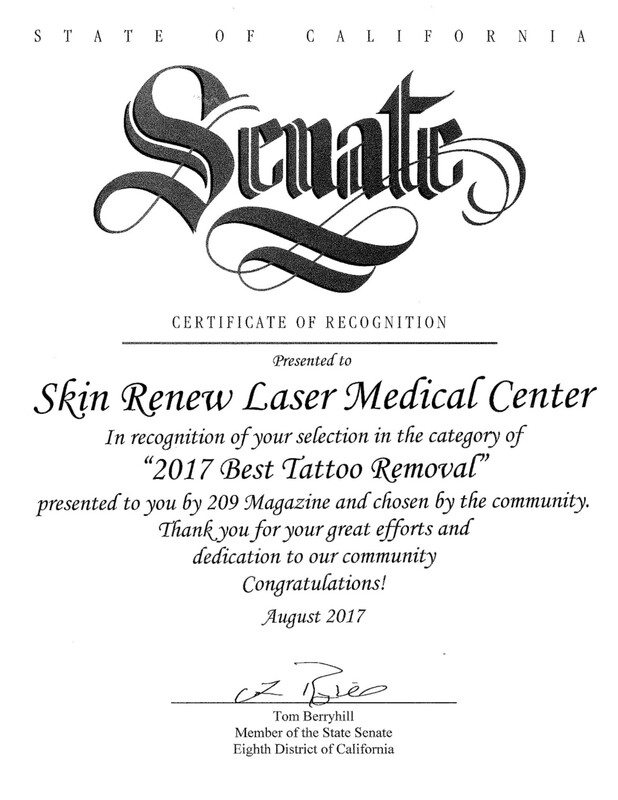 Laser tattoo removal is the latest advancement in tattoo removal treatment designed to completely eliminate unwanted tattoos in a non-invasive modern way, without leaving scars or un-pigmented areas of skin behind. Individuals with fair skin and superficially placed tattoos on the arms, chest, buttocks or legs are the best candidates. Darker skinned individuals or tattoos on areas where there is less body fat are the most difficult to treat. Individuals with black tattoos or dark tattoos are candidates for removal as SkinRenew does NOT remove “colored” ink tattoos. A high-powered Q-Switched Nd:YAG laser is used to remove unwanted tattoos and pigmented lesions (sunspots, freckles, etc.). It emits a highly focused beam of laser light, which passes harmlessly through the outer layer of the skin and is absorbed primarily by the tattoo ink or the excess pigment within the lesion. As quickly as the light is absorbed, it is quickly converted to heat. The sudden rise in temperature with the treatment targets and fractures the ink or pigment into tiny particles. Tattoo ink fragments are then carried away and cleared by your white blood cells and the lymphatic system. Most patients do not find the treatments uncomfortable of objectionable. Each laser pulse feels like a brief sensation of heat or feeling of snapping of rubber band or hot bacon grease on the skin. If desired, an anesthetic cream, local ice, or compressed chilled air may be applied to minimize such discomfort. The treated area may feel tender after treatment, but subsides within a few days. Immediately following the treatment, the treated area may be sore and tender to touch. Also, the skin will appear swollen and red and possibly bruised. This may be followed by crusting and scabbing which may persist 1-2 weeks. We recommend local icing as much as possible to decrease discomfort and swelling. The treated area will be more sensitive to sunlight. To minimize potential side effects of hyper- or hypo-pigmentation, we recommend that direct sun exposure is avoided and sunscreen be worn throughout the treatment course. Results will vary depending upon the depth, age, and size of the tattoo and the kind of ink that was used. Multiple treatments are necessary to fade or remove your tattoo. SkinRenew has been removing tattoo’s for over 14 years. By our experience your per average treatment protocol is “6-12” laser treatments for complete removal. Each treatment sessions are scheduled at intervals of “8-10” weeks to give ample time for your lymphatic systems to clear the tattoo. However, this interval can be longer depending on your individual response. In some instances, significant fading of the tattoo can continue for up to 6 months after laser treatment.